You'll be £10.50 closer to your next £10.00 credit when you purchase Flying Legends of World War II. What's this? Order within the next 4 hours, 13 minutes to get your order processed the next working day! Fifty Allied Force’s WWII aircraft types are illustrated in previously unpublished black and white and unique colour photographs. Each type is described giving vital data on development history, combat record, famous pilots and significant air battles. Performance, range and weapon loads are also included. The unique colour photographs are from the collection of the late William B. Slate, an aviation photographer who strove to capture the thrilling perspective that can only come from close-up, in-flight vantage points from an aircraft flying in formation. Philip Handleman has published 21 previous successful aviation titles and is a highly respected contributor to newsletters and magazines. Airlife published several of his books including Chicago O’Hare, Speedsters and Cityhoppers. He lives in Birmingham, Michigan, USA. Despite the horrifying things that occurred, here are many aspects of World War Two which still intrigue us to this day and arguably the most popular are the aircrafts which were used to fly the allies to Victory. 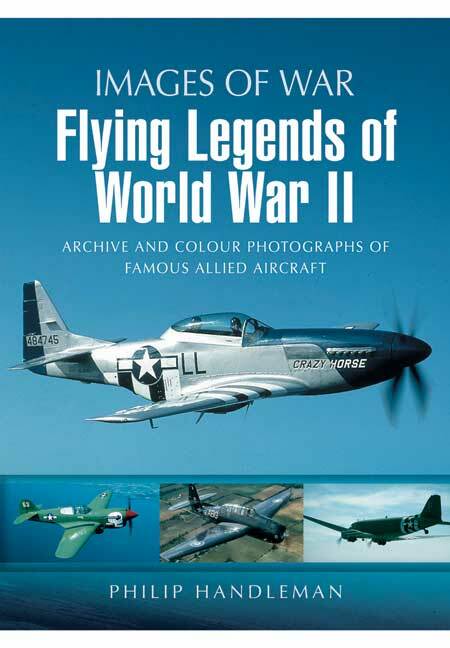 Flying Legends of World War II contains everything from bomber, fighter, trainer and transport aircraft in revealing black and white and dazzling full colour images. Every model is accompanied by a paragraph and series of bullet points detailing aspects such as history, combat record, famous pilots and significant air battles. It is with great thanks to William B , Slate for the glorious photographs of such aircrafts as the Douglas A-20 Havoc and of course the dangerously beautiful Spitfire. Philip Handleman uses his experience as author of previous aviation titles effectively and creates a relaxing but educating read.